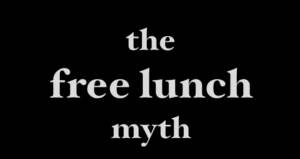 The below is in response to Milton Friedman’s popular “The Free Lunch Myth” video (also embedded at the end of this post). Nobody actually believes these things. Milton is gonna waste our time disproving them anyway. Corporate propaganda’s not going to spread itself. This is dishonest, faux folksy rhetoric meant to fool the uninformed into thinking Milt’s just using plain old common sense in his efforts to defend the common man. A corporation is a legal entity created by the government. (Oh no!) Most corporations have limited liability, which limits what actions can be taken against a company to the business itself, not its investors, shareholders, workers, or customers. If a business fails and declares bankruptcy, its investors cannot be sued by the businesses creditors, only the corporation itself. As much as clowns like Friedman want to valorize “job creators” for putting their livelihood on the line to help the economy, their risk is limited to what they invest in the corporation. Failure does not put the rest of their assets at risk. There absolutely is business. Business and individuals both have legal personhood status. An individual who also owns a business has two distinct legal personhoods. The Waltons and Wal-Mart are distinct entities for taxation and other legal purposes. Friedman is ignoring this reality because he is a dishonest hack. Was this Nobel Prize winning economist unaware of stock vs. non-stock corporations? Did he overlook the distinctions between a C corporation and an S corporation? I doubt it. He is again counting on the arcane nature of this stuff to fool the audience into swallowing his agenda. When Milt talks about workers, is he referring to Larry Lunchbox down at the factory and Nancy Nurse at the hospital or is he referring to Lloyd Blankfein and Angelo Mozilo? Or is he lumping them all together in a weak attempt to obscure the obvious differences between the different types of workers? Yes, he is conflating to obscure. What about the customers? Capitalism rests on the idea that if a business can’t satisfy consumer demand while making a profit, it will fail or be outperformed by its competitors who can. Businesses can attempt to pass on every cost to customers but doing so will cause them to lose customers. This is so basic it’s funny to even have to spell it out. All of Milton’s points rest on the assumption that profit margins are sacrosanct and all expenses must be transferred to others. That is the paradigm businesses operate under: costs must be externalized or socialized, profits must be privatized. The role of business is to maximize of its profits. The role of government is to affect the safety and happiness of the people. If a business can’t make a profit while operating within the parameters the government has set to affect the safety and happiness of the people, the business should fail. That’s capitalism. The government has no obligation to sacrifice the safety and happiness of the people to assist business in maximizing profits. Friedman is so wrapped up in his sycophancy to business he seems to think everyone should share it. He’s wrong. I wonder why Social Security is called an entitlement? Not really. It’s called an entitlement because even moderately intelligent people understand that individuals are entitled to it by virtue of their having paid into it. Social Security was enacted because most individuals had demonstrated that they were unable or unwilling to independently save for their retirement. Before Social Security, the 1930 Census showed that 58 percent of men over 65 were still in the workforce. That percentage has been reduced to the teens these days despite longer lifespans. I love it when government affects the safety and happiness of the people! Bilkin’ Greedman does not love it because his entire agenda is to promote the profit seeking agenda of business. Which is fine until he dishonestly conflates the safety and happiness of the people with businesses maximizing profits. He does that kind of thing constantly. There it is in a nutshell. Profits, or “so-called profits,” are sacrosanct and can never be altered. Milton appears to be unsure whether profits even exist when it suits him, but he is also sure that reducing profit margins is verboten. He’s wrong again. Businesses can and have survived and thrived with reduced profit margins despite the free market fundamentalists’ view that anything short of perpetually expanding profit margins is an abysmal failure. Friedman also pretends that profits are always reinvested back into a business to the benefit of workers and consumers. This is obviously false, as billions of workers and consumers can tell you. Milton and his devotees like to claim that those people just don’t understand economics. He’s wrong again. To be fair, he’s probably just lying. Shocker, Milt. Who could have seen that coming? Here we see all of Friedman’s false assumptions and conflations used as a flimsy justification for further sycophancy. Corporations are back to being people rather than a legal entity granted limited liability and personhood status by the government. His false claim that profits don’t exist or are used only to benefit workers and customers is the pretext used to argue for government abdicating its rightful role in favor of catering to businesses and their role of maximizing profits. Excuse me, “so-called profits,” in this instance. No, of course not. Got any more brain busters? Someone decided to share this video, which isn’t actually about the role of government, because he thinks it is an example of economic facts, reason, and logic. He is deeply immersed in supply side economic theory. That immersion has led to myopia on nearly every other topic. Unfortunately for him, his myopia often leads to unintentional humor like we see here. Eric Koonitsky is devastatingly handsome, and he also works at a residential facility for people with developmental disabilities. He reads as much as he can, usually about 150 books a year and a bunch of the internet. Eric graduated from Syracuse University but was educated with his library card. He identifies as a supporter of the working class and has liberal views on most social issues.